Montreal Christmas—aka Noël—events and activities, as well as shopping options, are plentiful and 2018 promises yet another great Christmas season. No matter how you celebrate the holidays it can be a really fun time of the year in Montreal, even solo. 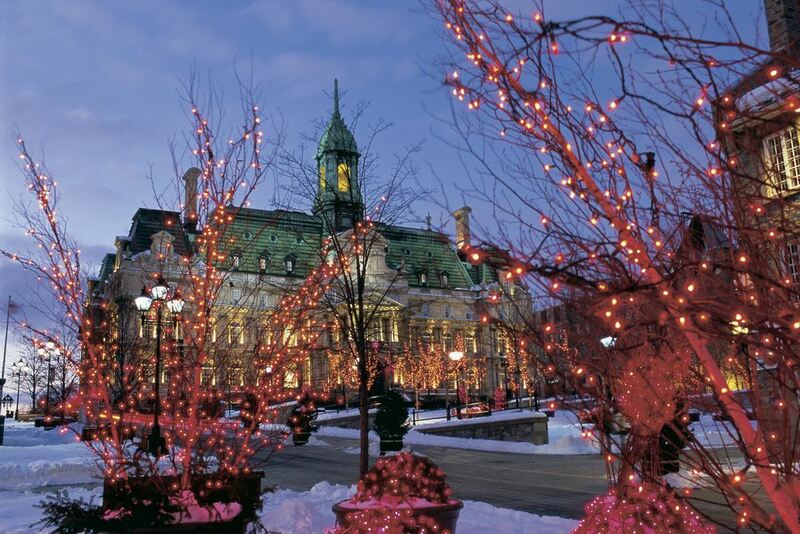 Tailor a Montreal Christmas experience that suits you and your lifestyle with a little help. Our guide features Montreal Christmas events, 2018-2019 holiday season highlights, and activities that suit every budget. A Montreal Christmas wouldn't be Christmas without the city's annual Santa Claus Parade, a tradition since 1925. Better known as the Défilé du Père Noël, the Montreal Santa Claus Parade typically features thousands of delighted kids waiting to catch a glimpse of Santa Claus, with about 15 to 20 floats proceeding along​ the downtown artery and top shopping destination, Ste. Catherine Street, from Fort to St. Urbain. 2018 Date: November 17 starting at 11 a.m.
A low key alternative to Montreal's largest Christmas parade is Montreal's second largest Christmas parade, the Défilé des rêves, a lesser known annual event held usually a week after the popular downtown Santa Claus parade. And it's great for kids. The parade is held at the Plaza St. Hubert shopping district. Drop by Luminothérapie for this year's interactive light installation where you can do things like make one of the 30 interactive seesaws light up and create sounds. You'll become one of the light artists as you play your way through the installations at the Quartier des Spectacles. The event serves as Montreal's largest competition for public art and there will be new installations juried in each year. At the Montreal Christmas Parade (Marche de Noël aux flambeaux) you can join in the candlelight procession with over 10,000 other people to celebrate the season. You'll join in with holiday characters and Christmas carolers as you walk along the route from L'Avenue du Mont-Royal. It's no secret Montreal has beautiful ornate churches. They are remnants of a time when the Catholic Church was very powerful in Quebec. Some churches charge admission and require tickets while others fit in all-comers. Attending Christmas Mass in Montreal is a lovely experience no matter what your belief system. Christmas Mass at St. Joesph's Oratory, the largest church in Canada, is about as special as it gets. Another very popular place to attend Mass is at The Notre-Dame Basilica located in Old Montreal. The Basilica charges admission for Christmas Mass. Christmas fireworks are an annual tradition at the Old Port. During December, on selected Saturday nights the sky comes alive with lights accompanied by music. The fireworks, feux d'artifice in French, take place starting the 15th of December. 2018 Dates: Saturdays, December 15, 22, 29, 2018 and January 5, 2019, at 8 p.m.
Saint-Joseph's Oratory, Canada's largest church, is located at the highest point in Montreal. The church celebrates the birth of Jesus with a variety with Nativities and Christmas music. This year, the Oratory will also feature an organ concert on December 2, 2018, in collaboration with the Montreal Bach Festival at 2:30 p.m. and will hold traditional Christmas Eve and Day Masses on December 24 and 25. The Oratory is open year-round, including on Christmas and New Year's Day, and access to the Oratory is free. However, there is a modest admission fee to enter the museum, which is open every day from 10 a.m. to 4:30 p.m. If you want something unique for a Christmas gift you can get some inspiration from this guide to Montreal's top Christmas shopping pop-up events. International gift shows include the colorful Tibetan Bazaar (and cultural festival). This year's bazaar takes place Nov. 17, 2018, from 10 a.m. to- 6 p.m. at the Eglise Santa Cruz, 60 Rachel O. There is a $5 entrance fee. Shop for jewelry and knitwear and enjoy traditional foods. If you are looking for unusual hand-made treasures, check out the Etsy Makers' Market. On December 15 and 16, 2018 enjoy the holiday market featuring over 100 Montreal makers. This market is held at the Théâtre Denise Pelletier in the Hochelaga-Maisonneuve neighborhood, in the east end of town. Annual Markets feature local and international hand-made goods, foods and fun gifts. These are the markets everyone looks forward to annually. Outdoor markets include the Nutcracker Market which runs from November 29 to December 9, 2018. The Noël dans le parc is more than a market and has events and bonfires. You can even purchase a tree that was grown at the park. This market runs from December 1 to 25, 2018. At the Montréal Christmas Village at Atwater Market, you can shop the market and watch outdoor movies. The market runs from November 30 to December 23, 2018. For a little European flavor, you can enjoy the German Christmas Market of Old Québec where you'll find traditional German gift items, and sip on a cup of hot mulled wine. This market runs from November 22 to December 23, 2018, Thursday to Sunday. Indoor markets include The Nutcracker Market where Les Grand Ballets Canadiens de Montréal benefits from purchases made. Shop for home décor, toys, crafts, and jewelry. The market runs from November 29 to December 9, 2018. From December 7 to 9 and 14 to 16, 2018, you can shop the popular Puces POP Fair for interesting indie goods, including art, jewelry, food items, soaps, jewelry, and clothing. When was the last time you went to the country, spotted the ultimate tannenbaum, and chopped it down yourself? These pick-your-own Montreal Christmas tree farms are 30 to 90 minutes from Montreal and offer more than a quick conifer chop, so bring the whole family along for an afternoon of holiday fun. Montreal pretty much shuts itself down on December 25th, but there are a few exceptions to the rule for those who want to get out and about on Christmas. You can take in a movie on Christmas Day, ride the bus to a park or a city street to stroll, although the transportation hours adhere to a holiday schedule, and pick up some last-minute items at a convenience store. You can go gambling and grab a bite to eat at Montreal's Casino. While most park skating rinks and trails have no services available on Christmas Day, Bonsecours Basin's Old Port skating rink is open for business. A few Montreal restaurants are open on Christmas Day. Ideal places to find open restaurants are at major hotels. And Chinatown restaurants often are open. Maggie Oakes at the Hotel William Grey offers a special 4-course, $45, and 5-course, $65, holiday menu on December 24 and 25, 2018 and Restaurant Renoir often has a holiday brunch. New Year's in Montreal is a blast if you play your cards right and plan for an evening you won't soon forget. This Montreal New Year's Eve guide includes a list of affordable bubbly, the city's hottest events, taxi services and a list of Montreal restaurants open New Year's Day, locales ripe with hangover nursing potential.